RMA cycle is an effectual process managed by MAG B1 to control the return and exchange of products purchased by customers in your store It allows your customers to request and manage returns and exchanges directly from your web store when your customer service staff engages to complete the cycle directly from SAP B1. Accepting returns or exchanges is a necessary component of great customer service. Customers tend to buy from vendors that offer a flexible return policy. Your loyal and potential customers expect this kind of service and highly appreciate it. Therefore, it is critical that this process is easily handled. automatically generate all the proper procedures to ensure that the item is noticeable and trackable until the process is completed. Options allow customers to choose an item to return, quantity, the reason of return, the item condition and specify the desired resolution: exchange, replace, or refund. Customers have access to all their RMA requests directly from their user account. Customers can select a specific item from an order which had several items. Customers can exchange a product for another product with a different size, color, etc. The price difference may be paid or refunded. the staff agent will discuss any additional information, ask for photos, etc. If RMA is accepted, the customer will receive an email notification and will be able to print an RMA Shipping Label, which includes the information about items to return and the return address. Each RMA status change will be visible for customers. With MAG B1, the staff can manage all RMA workflow directly from SAP B1 to ensure valuable customer services. MAG B1 with RMA extension supports all Magento products. Every RMA order has a specific id and still related to the original sale order id. staff can view the whole history of comments and status changes for each RMA. Founded in April 1975, to supply high-quality tools to Forestry Professionals, Arborists, Landscapers, and Property Owners at competitive prices, while providing world-class customer service with a complete choice for Work Gear, Logging, Urban Forest Management, & Tree Care, with nearly 100.000 square feet of warehouse space, customers all over the united states are assured quick and efficient delivery of their orders. 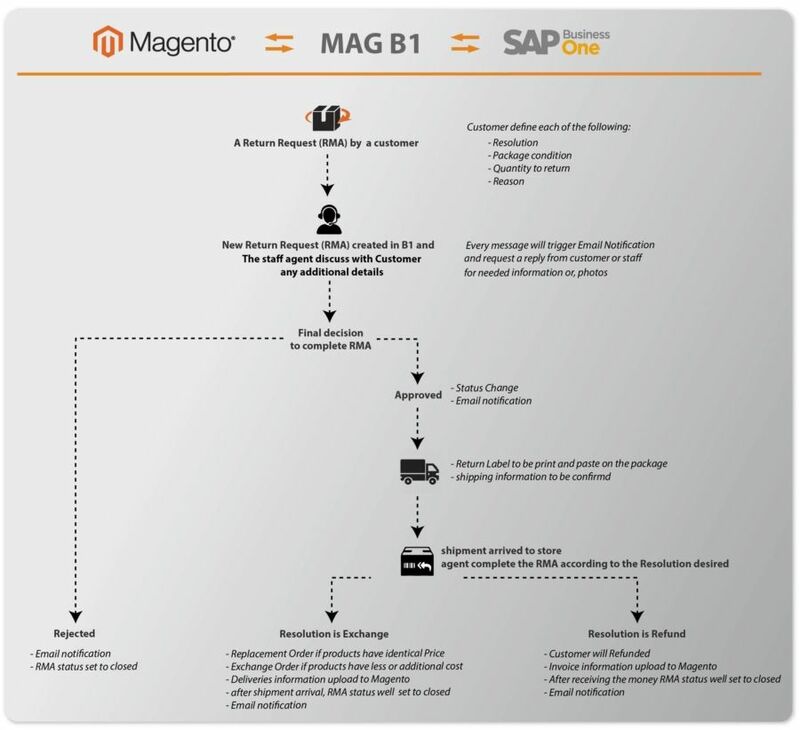 MAG B1 controls the return and exchange of products purchased by customers in your store It allows your customers to request and manage returns and exchanges directly from your web store when your customer service staff engages to complete the cycle directly from SAP B1.